‘Westerland’ rose and Lagerstroemia ‘Delta Jazz’, a new crapemyrtle with beautiful burgundy leaves and pink flowers which I am trialing for the Southern Living Plant Collection. 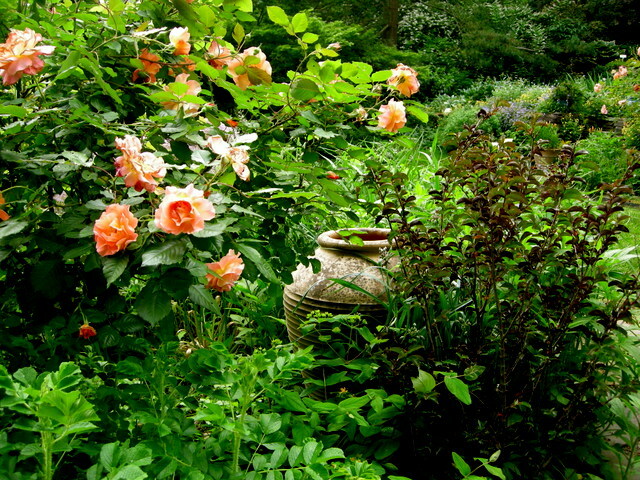 One of the most satisfying posts I have written is called Pleasurable Pairings for Spring and profiles plant combinations in my garden in April 2011. To read it, click here. It has taken me over two years to find the time to do a similar article for another season, but this post and the next will show pleasing plant pairs for early summer. 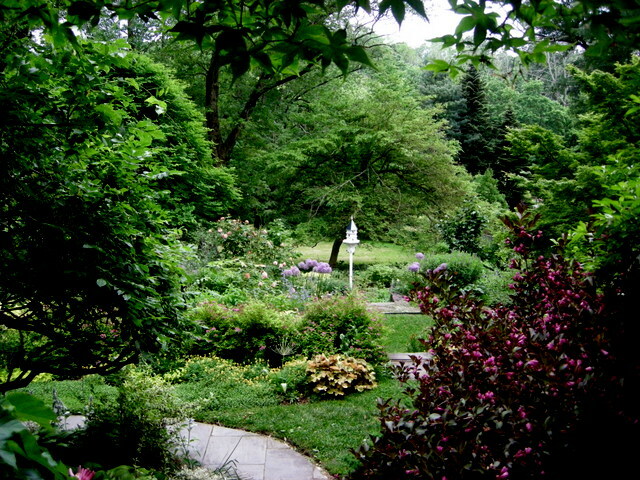 I have also included some long views of the gardens to give readers a sense of place. My house is on a south-facing slope, and this post includes the gardens on the west side in the order in which you would encounter them. The east side is in Part 2. Looking down the front steps on the west side of the house across two of the three terraces to the dovecote at the bottom. As you walk down the steps, you pass my many miniature hosta containers, including this strawberry jar with 16 different hostas—one for each pocket. 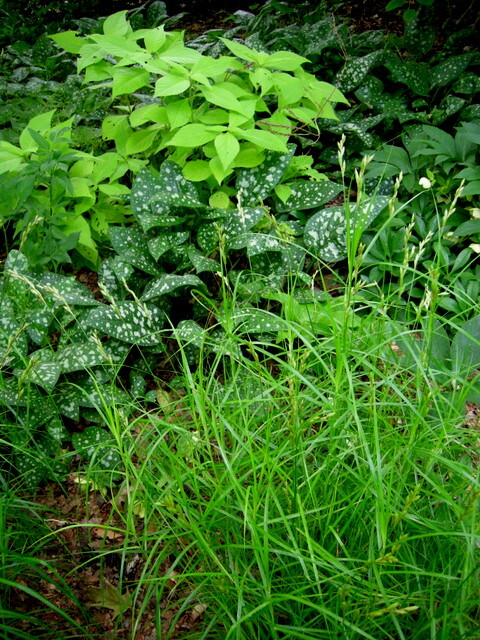 Miniature hostas are available mail order. To see the catalogue, click here. This is a new container that sits on the steps to the side door. 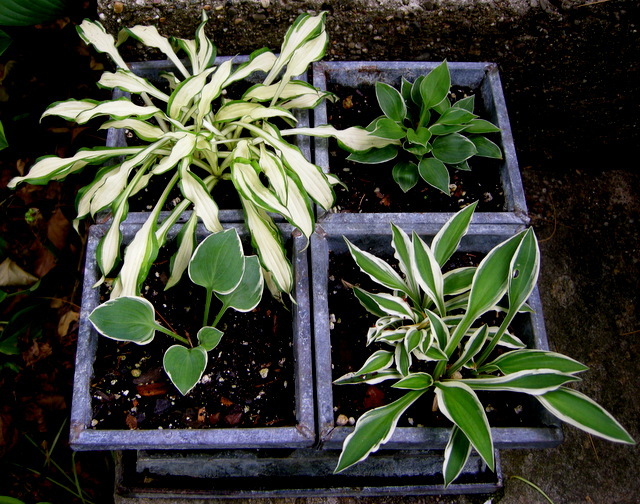 Clockwise from upper left: Hosta ‘Shiro Kabitan’, ‘Dew Drop’, ‘Hi Ho Silver’, and ‘Country Mouse’. 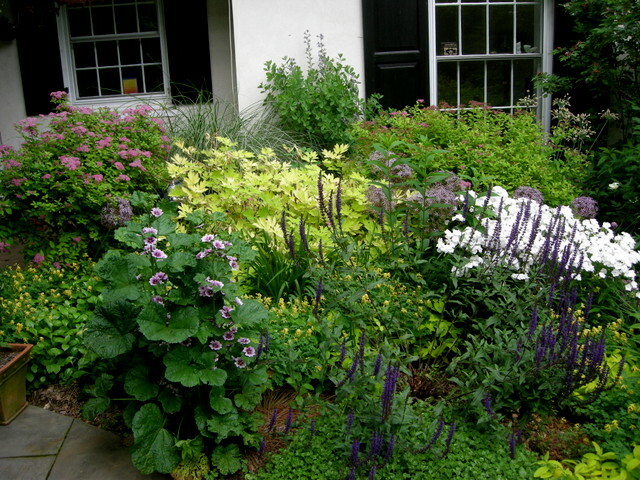 The main perennial bed by the front door on the middle terrace. Looking from the front door towards the dovecote: ‘Minnie Pearl’ phlox, ‘Goldheart’ bleeding-heart, and ‘Caradonna’ salvia. 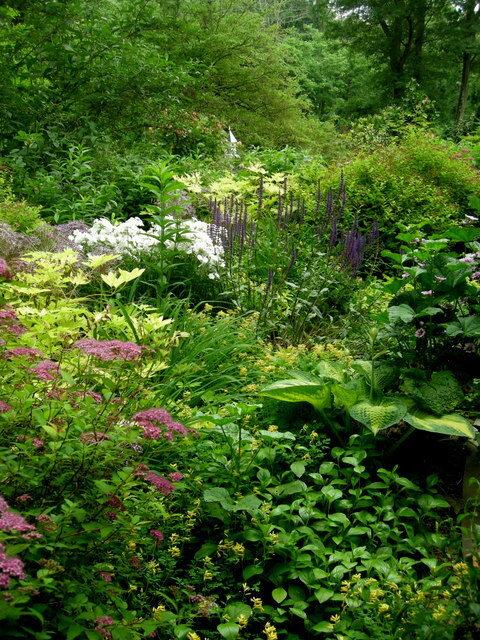 A longer view of the main perennial bed. 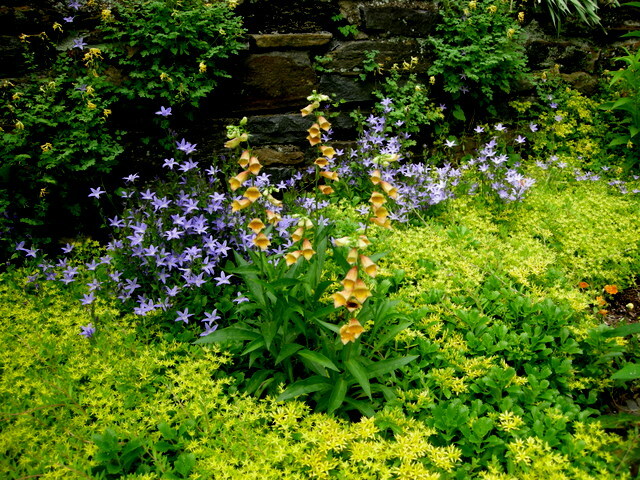 The other end of the main perennial bed: yellow corydalis, allium, ‘Magic Carpet’ spiraea, and ‘Caramel’ coralbells. The right side of the steps to the lower terrace: ‘Katherine Adele’ hardy geranium, yellow corydalis, and ‘Blue Waterfall’ campanula. The left side of the steps to the lower terrace. 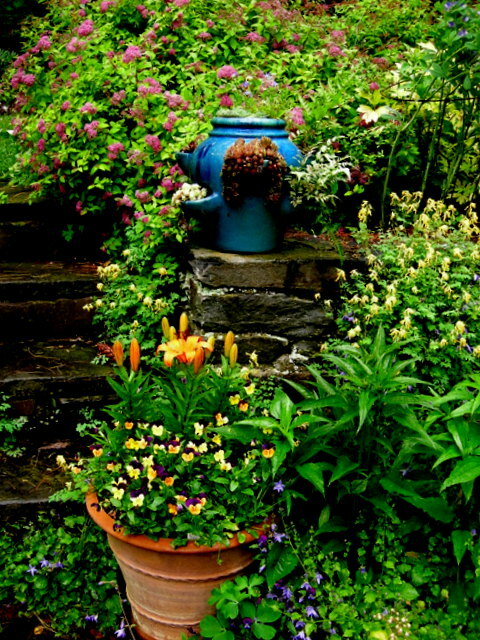 A close up of the container on the left side of the steps with dwarf orange lilies and violas, which have been in full bloom with no dead-heading since mid-March. Yellow corydalis in the wall with ‘Goldcrest’ foxglove surrounded by ‘Blue Waterfall’ campanula and sedums in bloom. 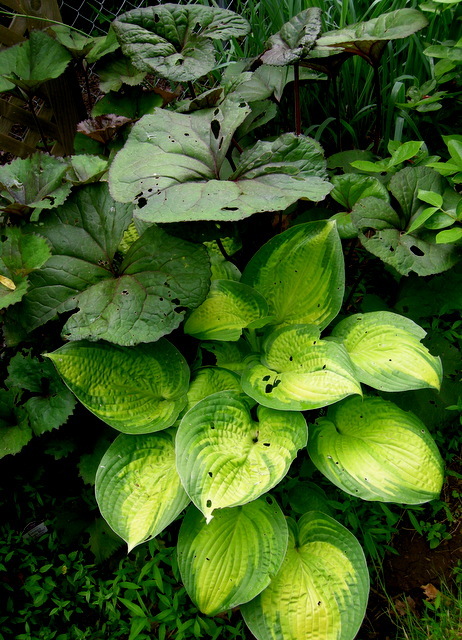 Just below the lower terrace: ‘Whirlwind’ hosta and a self-sown fern. 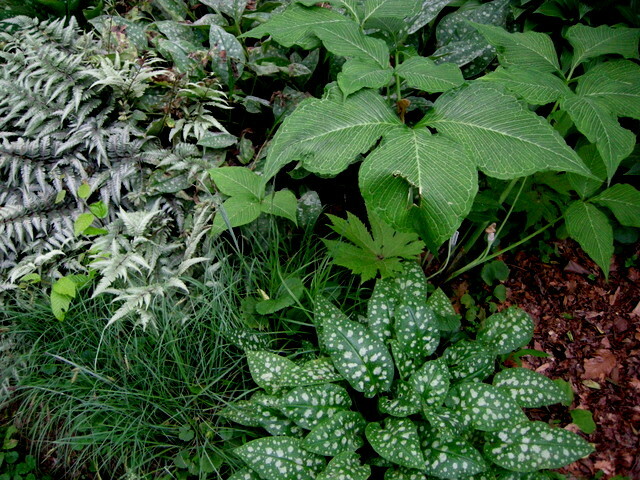 In a very dry and shady garden below the dovecote, clockwise from upper left: Japanese painted fern, ‘Sparkler’ native jack-in-the-pulpit, pulmonaria, and black sedge. In another very dark area, Japanese shrub mint in back, ‘Leopard’ pulmonaria (one of my favorites for its giant spots), and native sedge. Along the fence line on the west side of the property, ‘Othello’ ligularia and ‘Paradigm’ hosta. Also along the fence, ‘Ametyst Falls’ American wisteria, which I think is just as beautiful as the Asian varieties, and monkshood. 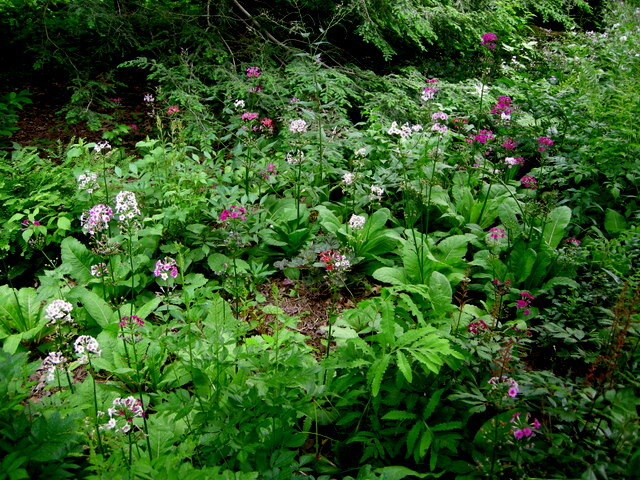 At the very bottom of the property in the only moist garden we have, Japanese primroses, which self-sow with abandon, are succeeded by astilbes and ferns. For Larry with best wishes for good health, the first flower on my native Magnolia ashei, a close relative of native bigleaf magnolia. I hope you enjoyed the tour. Stay tuned for Part 2, the shadier east side of the house. Nursery Happenings: We are having the final spring open hours at the nursery on Friday, June 7, from 10 am to 4 pm, Saturday, June 8, from 9 am to 2 pm, and Sunday, June 9, from 1 to 3 pm. Customers will get an email with the details shortly. Appointments are available through June 15 when we close for the summer, reopening in the fall around September 15. The 2013 Miniature Hosta Mail Order Catalogue, containing over 35 choice selections of miniatures for shipping all over the US, is on the right sidebar here, and we are still shipping. If you are local, you can use the catalogue to see what miniatures are still available at the nursery. This entry was posted on June 5, 2013 at 1:16 pm and is filed under hosta, my garden, Shade Gardening, Shade Perennials with tags 'Delta Jazz' crapemyrtle, 'Goldcrest' foxglove, Amethyst Falls American wisteria, Arisaema triphyllum Sparkler, Blue Waterfall Serbian bellflower, Campanula 'Blue Waterfall', Carolyn's Shade Gardens, Corydalis lutea, Digitalis 'Goldcrest', Hosta 'Paradigm', Hosta Country Mouse, Hosta Dew Drop, Hosta Hi Ho Silver, Hosta Shiro Kabitan, Hosta Whirlwind, Japanese shrub mint, Lagerstroemia 'Delta Jazz', Leucosceptrum japonicum, Ligularia Othello, Magnolia ashei, miniature hostas, Southern Living Plant Collection, Sparkler jack-in-the-pulpit, Wisteria frutescens 'amethyst Falls', yellow corydalis. You can follow any responses to this entry through the RSS 2.0 feed. You can leave a response, or trackback from your own site. Just beautiful. And so inspiring! 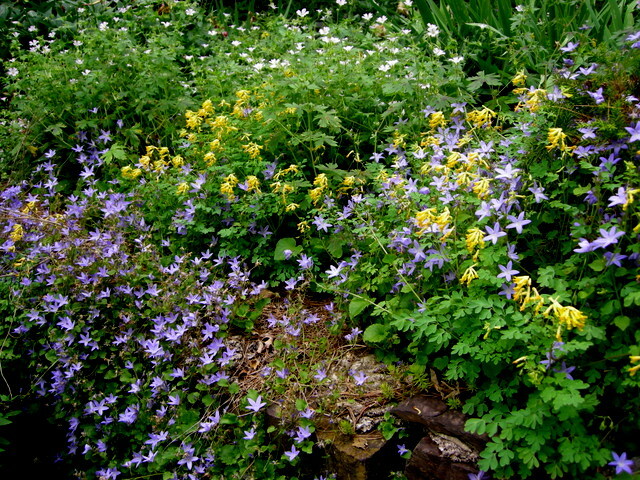 I love the ‘Waterfall’ campanula with corydalis. I also have the Digitalis grandiflora with Corydalis lutea and think it’s a winning combo. 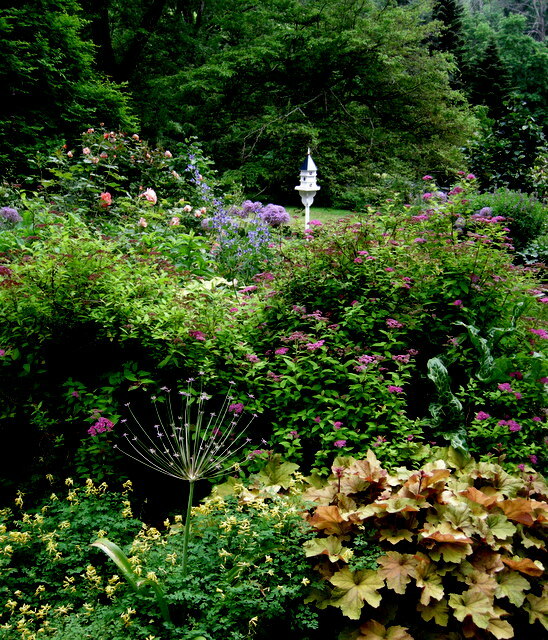 Thanks so much for sharing, it’s a lovely post of a lovely garden. Simply Stunning! I just got in from gardening till it was too dark. What a treat to tour your garden after. You have inspired me, I have a couple of strawberry jars that need planting, I think I’ll put hosta in them as well. All the purples, oranges, and yellows are so complimentary. And the Hostas arranged in the adjacent square containers add a nice bit of whimsy. Thanks for the plant pairing suggestions–I took some notes! You have some really interesting and inspiring combinations, your strawberry pot with your little hostas is beautiful. I really like the combinations where it is just foliage forming a wonderful tapestry of leaves contrasting in colour shape and texture, that is what I am aiming for here. Oh how wonderful to look at your beautiful garden again. I have missed it with over work and winter blues. The hostas are still my favourite in your garden. Thank you for sharing. Okay…now I have to get a strawberry jar. That is just brilliant! Do you leave that out over winter? I agree. 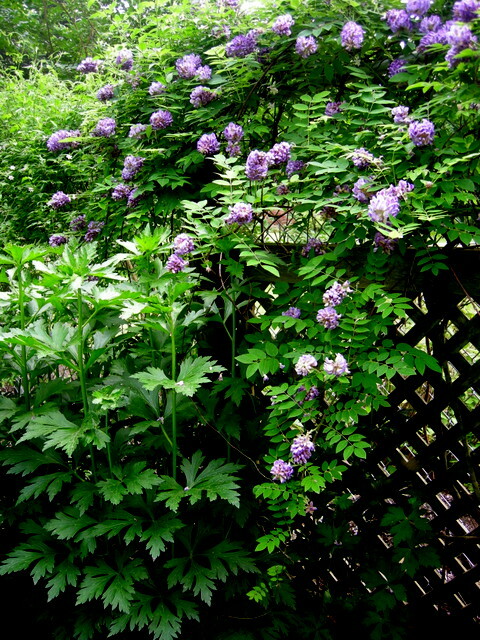 Your American wisteria is just as beautiful as the Asian varieties. Thank you for the stroll in your lovely garden, so nice to see wider shots of it to get a sense of the space. I love your strawberry jar, I have seen them over here too, I have been looking for a glazed one in red so it would fit with the rest of my pots, seems I have to buy one unglazed and paint it myself as I haven’t found a red one so far. Great to see all your companion planting, and with as much space as you have you really can have a lot of different plants! 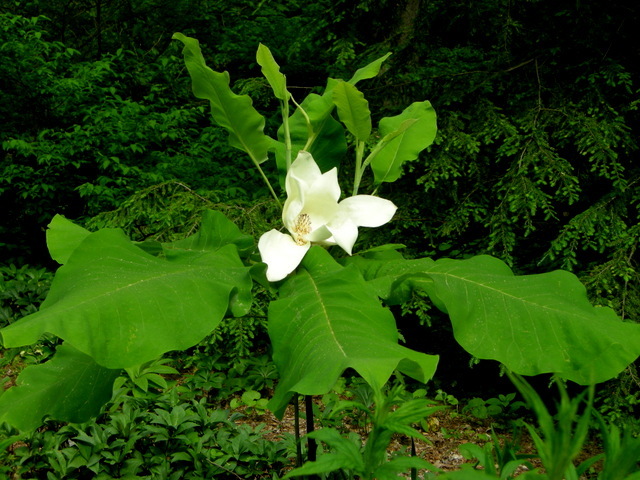 Oh, and your magnolia is lovely, how wonderful that it can flower already as such as small plant! Take care, have a great week-end, Helene. Hi Carolyn, I appreciate the longer views in your garden. You have some wonderful combinations, and everything is lush and beautiful! I am in love with your Leopard pulmonary. 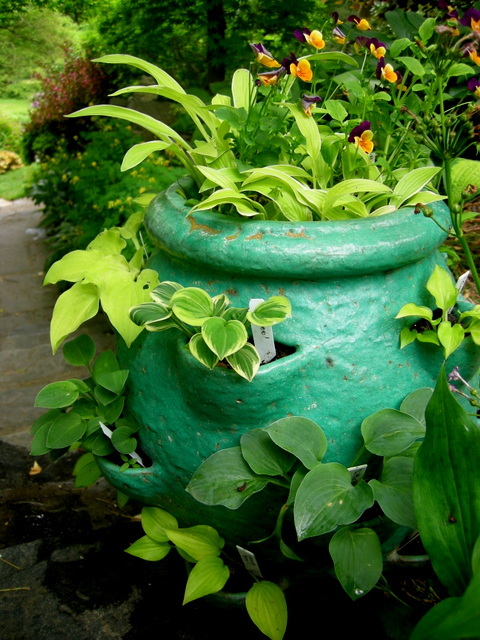 I also like the idea using a strawberry jar for miniature hostas. 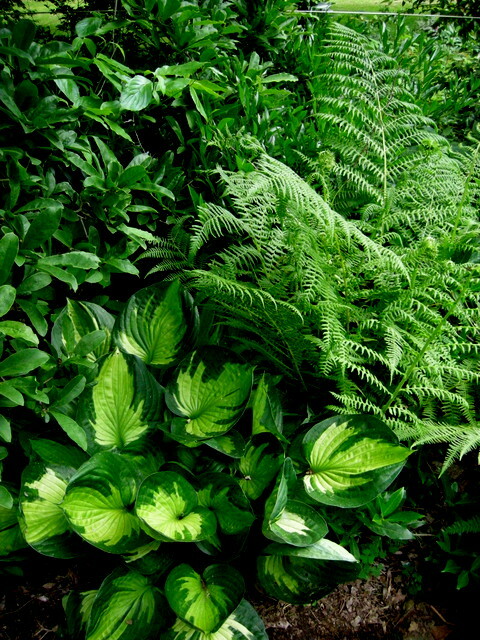 The hosta and fern is my favourite pairing. The contrast really shows off the hosta. 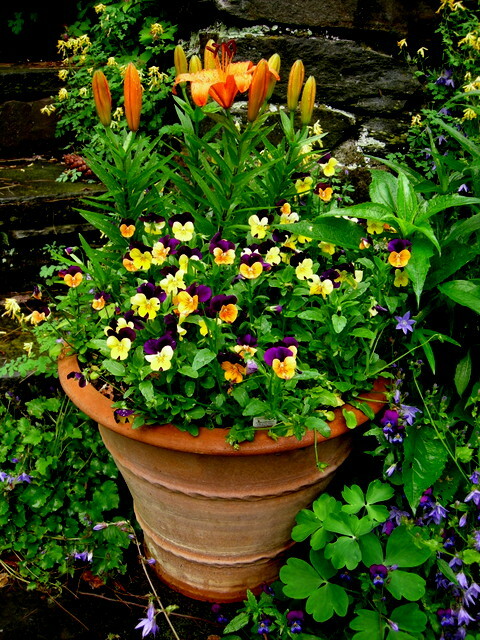 Carolyn I love these combos…my miniature hostas are growing in beautifully in their pots…. Fabulous tour Carolyn and the ‘Whirlwind’ hosta is a real beauty. 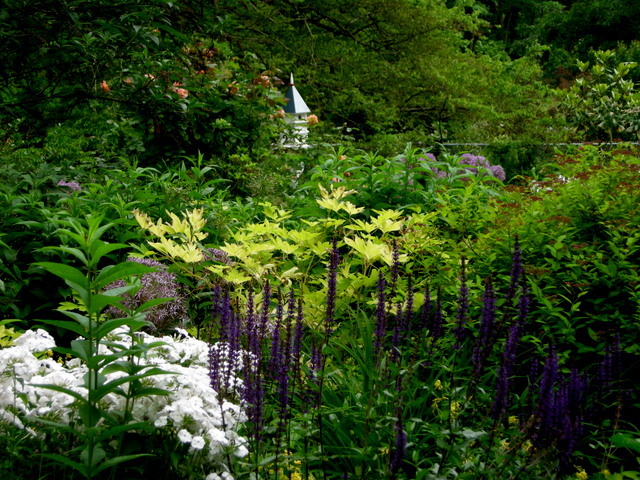 You have a great garden … so busy … love it!